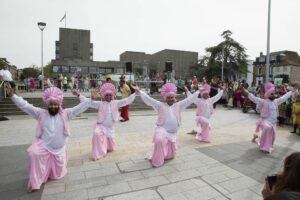 Four by Four Bhangra Dancers at the Celebrations (c) Gravesham Borough Council. 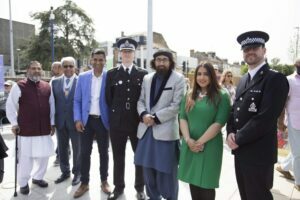 Around 500 people attended celebrations at Gravesham Community Square on June 23rd to commemorate the Festival of Eid, one of the most important dates in the Muslim calendar. Eid marks the end of Ramadan when people from the Muslim faith fast during daylight hours. The celebrations were arranged by Kent Equality Cohesion Council working in partnership with Gravesham Borough Council, Gravesend & Dartford Muslim Association and Gravesham Muslim Cultural Education Centre. From left to right: Mohammed Aslam, Dr Vasudaven DL, Gurvinder Sandher, Assistant Chief Constable Pete Ayling, Imam Tahirain Ali Shah, Cllr Gurjit Bains and Chief Inspector Andy Gadd. (c) Gravesham Borough Council. Deputy Lieutenant Dr Bhargawa Vasudaven DL represented the Lord-Lieutenant at the event. Also present were The Mayor of Gravesham, Cllr David Hurley, and Assistant Chief Constable Pete Ayling and representatives from different faith groups including the Guru Nanak Darbar Gurdwara, Hindu Cultural Society and Saint George’s Church. The celebrations involved the raising of a flag celebrating the Festival of Eid, musical entertainment, fun fair, face painting and the handing out of free food to not only those in attendance but also members of the public passing by.